The players will have former teammate Christian "Chucho" Benitez in their hearts as they gear up to try to surpass their top 16 finish in 2006. 1. First off, their jersey is pretty sweet. 2. The country is in South America and Ecuadorians speak Spanish. 3. Fun fact: They're also the largest exporter of bananas in the world. 4. These are Ecuador's fans. 5. They really get into it. 6. Ecuador previously made the World Cup in 2002 and 2006. 7. In 2006, they had their best finish ever, finishing in the top 16 before losing to England 1-0. 8. David Beckham had the deciding goal with this ridiculous free kick. 9. Their player to watch this year is captain Antonio Valencia who has a heavy heart and big shoes to fill. 10. Christian "Chucho" Benitez, Ecuador's leading scorer in the qualifiers, and a close friend of Valencia died last year suddenly of a heart attack. 11. Valencia got a tattoo in memory of his friend. 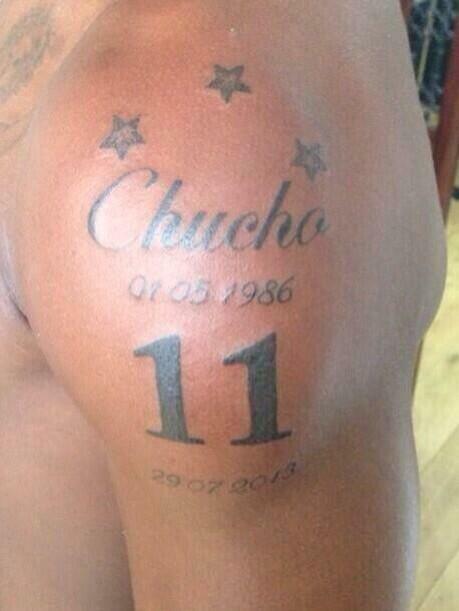 Antonio Valencia heeft nav het recente overlijden van Christian &#39;Chucho&#39; Benitez (27) een nieuwe tattoo. Antonio Valencia heeft nav het recente overlijden van Christian 'Chucho' Benitez (27) een nieuwe tattoo. 12. The team is in group E, with strong contender Switzerland, former champion France, and Honduras, a team that isn't expected to do very well. 13. The team's coach is Colombian Reinaldo Rueda. Here he is being intense. 14. Everyone thinks Switzerland and France will battle for first and second, but Ecuador which rose to 10th in FIFA's rankings last year, thinks it can shock the world like it did in 2006. 15. So, what are their chances of winning this year?